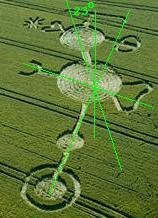 Crop Circles are often noted for their beautiful symmetry, as though painted by an artist. What man sees as beauty is what God has painted, as in nature balance is sought and achieved. We have explained that the planets maintain their Orbit distance due to a particle flow crowding near the Sun, are Swept along by an invisible broom of particles, rolled into the Ecliptic by a backwash of invisible particles, aligning themselves with a Magnetic field which is yet another invisible particle, and held at bay from the Sun by yet another Blast of invisible gravity particles. We have described the early signs that Planet X was beginning its passage, in 1995, as a disrupted Equilibrium in the solar system, the long reach due to the many particle flows that man is unaware of. 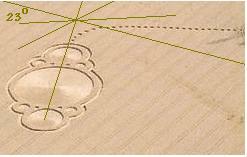 Crop Circles that present symmetry are presenting the undisturbed solar system, and in a similar manner, Crop Circles that present a chaotic picture are showing you how the passage of Planet X disrupts this symmetry. A common theme, as we have mentioned, is that 23° is the Key. 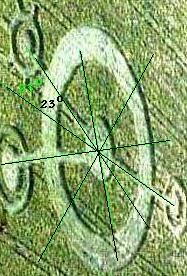 One can note, in the Crop Circles presenting an imbalance, that the resolution or exit point represents a 23° angle from the norm. Why is 23° the key? It is not by accident that a 23° tilt of the Earth occurred during the swift pole shift during the Last Passage when little lingering during a face-off occurred, as Planet X was already at the Ecliptic when the Earth arrived to face it. As we have mentioned, the Earth had barely started into a crust shift when it was jerked back into alignment with the S. Pole of Planet X, now quickly above the N. Pole of the Earth. And this was the angle at which Planet X was exiting. The core of the Earth gradually, within days, aligned magnetically with the dominant Sun, but by this time the Earth's rotation had already established itself, thus the offset between the geological and magnetic poles that exists today. If Planet X was exiting at that angle, might this be the angle it assumes, along the magnetic flow lines of the Sun, as it approaches the Earth in her orbit? 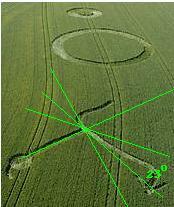 Asymmetrical Crop Circles are relaying the degree of distress, in crowded particle flows, in conflicting forces, that the passage of a massive magnetic planet too close too the Sun for its size, causes. This is not a happy time for man, as weaving too and fro, often with sudden jerks, Planet X creates particle flow distress for the Earth as well, in her wake. A wild ride, with many surprises, that explanations such as Global Warming or asteroid swarms scarcely cover.